The rod that is carried under or alongside the barrel in a gun or pistol is normally referred to as the ramrod – the term ‘loading rod’ usually refers to a separate wooden or plastic rod that is in one piece and carried separately. It will be stronger and a bit longer than the ramrod and have a more substantial button on the end that is pushed. The 3 piece rod usually supplied in gun cases it isn’t equipped with an end suitable for loading and is really an unloading and cleaning rod and is often supplied with a jag ( a brass fitting to hold a wrap of tow or rag or polyester fibre for cleaning) or a wool mop for oiling the barrel in breech loaders. Almost all guns and pistols that might be used in the field or for defense had ramrods, and that probably goes for all flintlocks, but there were some types of firearm that did not usually have them fitted ;- percussion live pigeon guns and late percussion target pistols and special target rifles being examples – guns that were used in a single location where a loading table was part of the shooting setup, and in the case of target weapons, where the barrel might need to be swabbed between shots. Late target pistol by Bales of Ipswich made without ramrods but with a loading/cleaning rod in the case. The form of the ramrod depended on the type and function of the gun – muzzle loading rifles needed a strong ramrod to force the patched bullet down the barrel – sometimes requiring a mallet to knock it down, and these would sometimes be steel, as in almost all military arms. Where a ramrod was intended to drive the bullet down the end was usually shaped to conform to the front of the bullet. Pistols and carbines intended for use on horseback normally had captive ramrods with a link mechanism at the muzzle and were of necessity steel. Most sporting guns and and duelling pistols had wooden ramrods, as did many rifles, allbeit with stouter rods than shotguns. 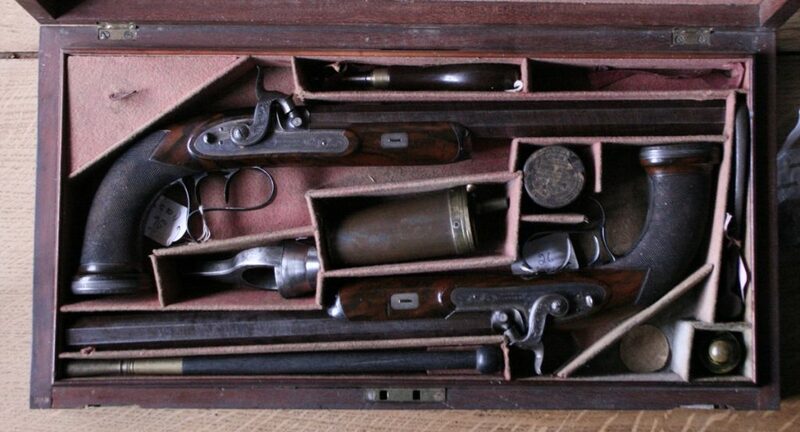 For long guns the wood used was often ebony or rosewood, both dark woods, but pistols do seem to have lighter coloured wood in some rods. It is, of course, very difficult, if not impossible, to determine if a particular rod is as old as the gun it is with, or when it might have been replaced. Wooden rods are probably the part of the gun most likely to be broken of lost, so a good proportion of rods may well be contemporary replacements, not to mention recent replacements. 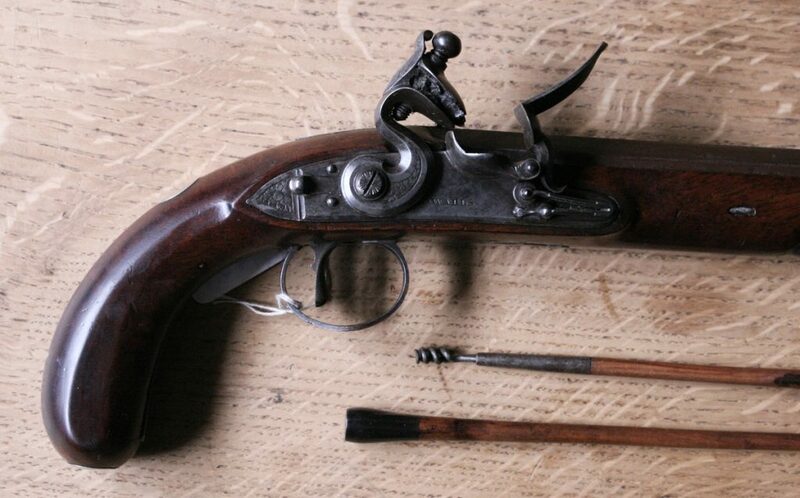 Wooden rods had either brass or horn tips, or sometimes in pistols were just the wooden end of the rod. Brass tips were in two forms – with a through hole that slipped over a turned down portion of the rod and was held in place by a small wedge or a brass pin, or as a cap over the end of the ramrod usually pinned with a brass pin. Rifles normally had the cap type tip because it had to be more or less shaped to the nose of the bullet or to the ball, and needed to be stronger. Horn tips were always of the cap type, and were fixed without visible pins. The tips fell into two rough shape catagories – the trumpet shape and the tulip shape – I’m not sure if there is any correlation between date and shape although a lot of pistols and guns around the last quarter of the 18th century had slightly tulip shaped tips. The other end of the rod of a long gun usually terminated in a brass fitting that housed a tapered screw thread of a particularly deep, square thread form under a screw off brass cap. The screw was to unload the gun in case of a misfire or a wrong loading – i.e. forgetting to put any powder in (we have all been there). Ramrod screws almost always had a deep, square cut thread – woodscrews won’t do! Ramrods are generally quite thin, and because they need to be accommodated under the barrel, are rarely much longer than the barrel, meaning that typically when the rod is dropped in the barrel without a load, only a centimeter or so protrudes making it difficult to get hold of the rod if you need to extract a charge. For these reasons modern shooters of muzzle loaders in ‘static’ shooting situations almost never use the gun’s ramrod, preferring to carry a stout plastic rod for loading and a sectional cleaning rod with an extractor screw for unloading. For walk-up shooting and shooting ‘on the fly’ you might want to make a holster on your belt to carry the loading rod. Apart from their use in loading and removing charges, ramrods are part of the balance of a shotgun, and for that reason it is always better to leave one in place, even if you don’t intend to use it. Because so many ramrods are replacements, its not uncommon to discover that they don’t fit particularly well, and as many barrels have at some time in their lives had a bit taken off the end of the barrel to ‘tidy it up’ or to go with the fashion for shorter barrels, the lip on the bottom rib that should hold the rod in has not been replaced – so there are guns where the ramrod jumps forward on firing, and if you don’t remember to push it back in may get pulled out by the blast. In this case put a bit of tape – ideally self vulcanising tape – round the rod in the position of the pipe nearest the muzzle and jam it in. Loading rods used in driven game shooting are often carried in a tube with a pointed end that can be pushed into the ground – the rod is then handy to pick up and put down and doesn’t get dirty and wet – it needs a funnel shape at the top to speed up putting it back! For clay shooting people have a variety of ingenious ways of coping with the loading rods – from modified golf trolleys to modified camera tripods, although most of us just carry the rod and leave it on the loading table or stand it on the ground somewhere! If you use a loading rod its a good safety idea to put a piece of tape round the rod to indicate how far it goes into the barrel when there is no charge in the gun – that way you can quickly check that its properly loaded, and also check easily for the very dangerous double charge in one barrel – one of the hazards of shooting muzzle loading doubles. Pistol stocks sometimes have a spring secreted within the stock or the rear pipe that is supposed to retain the ramrod. Medium sized old cleaning rods for most guns in the UK used 9/32 B.S.F. 26 t.p.i. threads for the brushes and jaggs etc at the business end – I’m not sure if they still do ? Sectional rods use a variety of different threads to connect them. .I have now made some unloading worms that have 9/32 x 26 (9/32 BSF) threads that can be screwed into tapped holes int eh end of loading rods, thus turning your loading rod into an unloading rod – you then don’t need to take a separate rod with you (usually a 3 piece rod) in case you have to unload. Send me a photo of the pistol and I may be able to help, otherwise just look at a lot of photos of pistols on google images. I have a double barrel percussion pistol, with the ramrod missing. Do you know where I might be able to get one, or have one made? Would love some advice on making a shotgun tapered ramrod. Wood is usually supplied straight in square section length. I think turning a taper on a lathe would not be easy? Yes, turning one is tricky, although I have done it, you need a hollow tailstock and headstock and a 4 jaw chuck and make a holder for the tailstock and turn it in 6 inch sections. It is probably easier to plane it tapered square, then cut 45 degree bevels on a couple of pieces of wood and fix them together so you can hold the square to plane off the corners to get a octagonal rod, then plane off the angles and finish in the lathe with hand held sandpaper. I prefer the second method – I do have a nice piece of ebony – enough for half a dozen rods- it cost about £100 – and I’ve got to make a few rods when I get the flat finished, maybe I’ll write it up. Interesting article just wondering if anyone could give me some info on a pistol ramrod I have? Sure, send me details/photo and as much info as possible. I’ll email you with my email so you can send it directly.